Penhaligon's Quercus Shampoo 200ml / 6.7 fl oz The delightful Quercus fragrance from Penhaligon's as a Shampoo. Found in the finest hotels and spas world-wide. Size: 200 ml / 6.7 fl oz. Also available: Quercus Hair Conditioner Quercus declares itself with a light burst of citrus and basil, supported by a heart accord of jasmine, cardamom and muguet that is sweet, spiced and supremely delicate. The greenness of the basil persists into the surprisingly resilient musk and sandalwood base notes. These are warmed through with moss and patchouli to create an elegant, strong and uplifting cologne. Named after the Latin for the British Oak, Quercus is a modern and invigorating cologne enjoyed by both men and women. 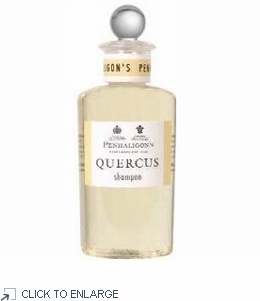 The delightful Quercus fragrance from Penhaligon's as a Shampoo. Found in the finest hotels and spas world-wide. Size: 200 ml / 6.7 fl oz. Quercus declares itself with a light burst of citrus and basil, supported by a heart accord of jasmine, cardamom and muguet that is sweet, spiced and supremely delicate. The greenness of the basil persists into the surprisingly resilient musk and sandalwood base notes. These are warmed through with moss and patchouli to create an elegant, strong and uplifting cologne. Named after the Latin for the British Oak, Quercus is a modern and invigorating cologne enjoyed by both men and women.